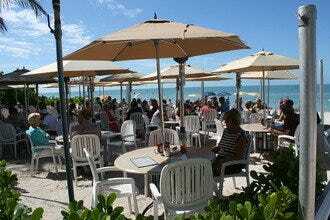 At the southern threshold to Naples, Marco Island quite frankly amazes visitors with its myriad restaurants that cover all price ranges, styles of cuisine and levels of sophistication. The choices are overwhelming, but this 10Best list guides you to the don’t miss restaurants in a variety of styles. 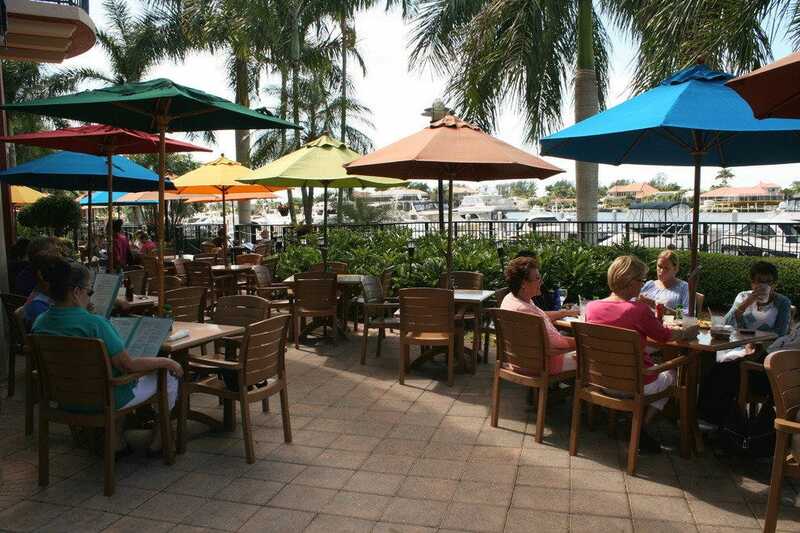 For instance, you can keep it casual and affordable with views of the water at longtime favorite Little Bar or newer, more modern Deck at 560 Bar & Restaurant. The funky fishing village of Goodland is home to quirky Little Bar, while Deck at 560 is tucked within the Hilton Marco Island Beach Resort. 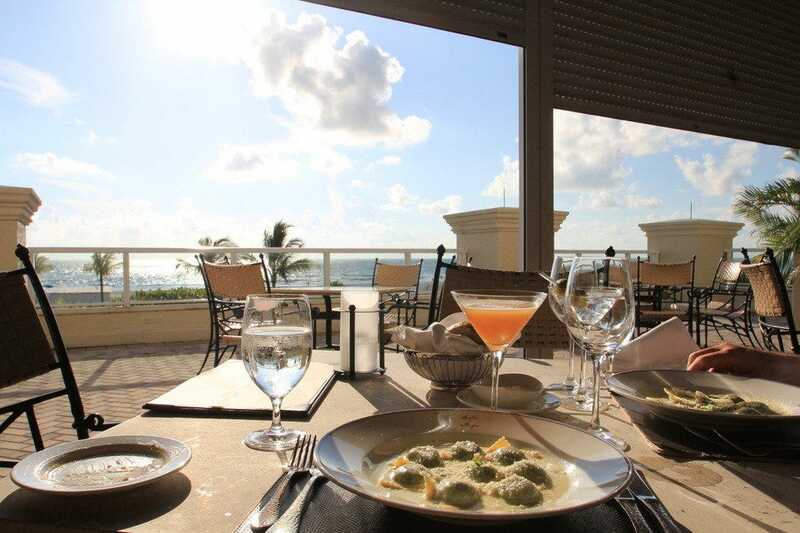 For special occasion dining, on the other hand, your options range from fine Italian at Sale e Pepe in the Marco Beach Ocean Resort to eclectic new American style at Verdi’s Bistro in a strip mall along the island’s resort area. 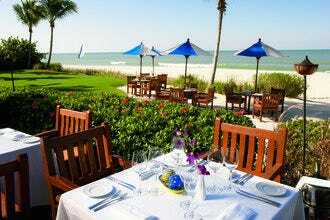 Newest to the resort scene, Tesoro wows at the newly branded JW Marriott Marco Island Beach Resort. Most of the restaurants concentrate on the fresh seafood from local waters no matter what their style. Enjoy everything from the ubiquitous fried grouper sandwich to grilled swordfish or salmon. Tucked into a strip mall next to a bike shop, Zaza could easily go unnoticed. So peel your eyes or miss a true taste of authentic Mexican cuisine enhanced with Tex-Mex hybrids such as burgers and Mexican subs (tortas). 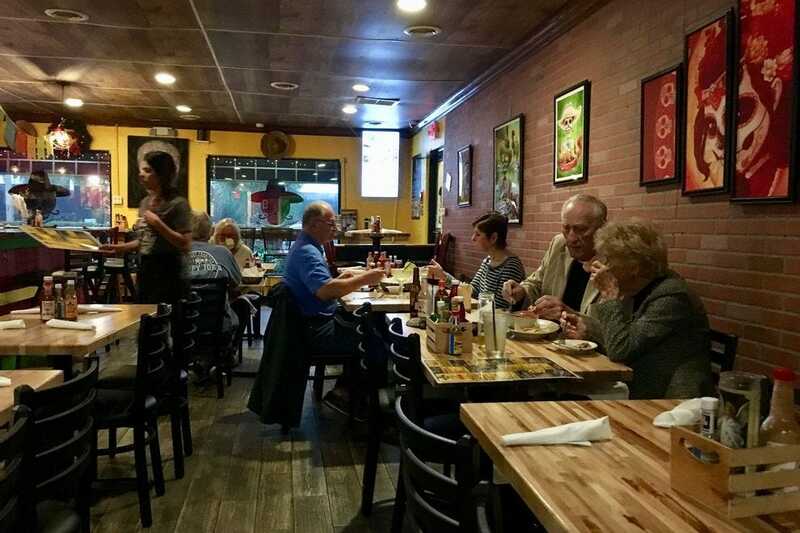 Its simple brick and wood interior and Latino staff make you feel you've crossed the border. The menu continues the illusion: 13 styles of street tacos stuffed with long-cooked house meats such as spicy chicken, carnita asada and short ribs. Tamales, burritos, enchiladas, fajitas, bowls, tortas and quesadillas also hold the home-cooked goodness. Mexican beers and sangria quench thirst and the spicy salsas Zaza dishes. If you are thinking this - with its casual bar vibe and sweeping water views - is just another pretty face, think again. Or just go ahead and taste anything on the menu. It's not fine dining, but the menu satisfies a lot of different appetites and the kitchen is dependably consistent. Start with the "lobster fries" - flash fried Maine lobster fingers - or, for something lighter, the ahi tuna poke. It treats its seafood to creative ways, such as the rum butter mahi and grilled salmon with mandarin salsa. Chicken pot pie and red-eye pork chop offer comfort, while salmon Florentine turnover and a PLT with portobello mushroom demonstrate a departure from same-old. You could sum up the fishing town of Goodland in one word: idiosyncratic. Likewise, the Little Bar, one of three longtime watering hole restaurants that tourists love as much as the (idiosyncratic) locals. Because besides the usual frog legs and seafood Everglades fare, its dry-erase board menu lists some Old World folk foods such as liver and onions, kielbasa and kraut and marinated herring. There's yet another dimension to its menu - finer fare such as crab cakes with lobster cream sauce and blackened shrimp. The setting is every bit as quirky. 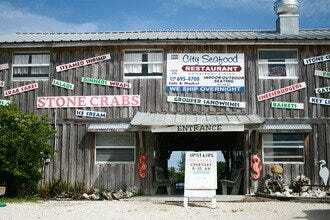 Outside, the view is bay waters, fishing docks and crab traps. The interior is cobbled together with salvaged wood from a historic boat, pieces of pipe organ, stained glass and various other components with a past. 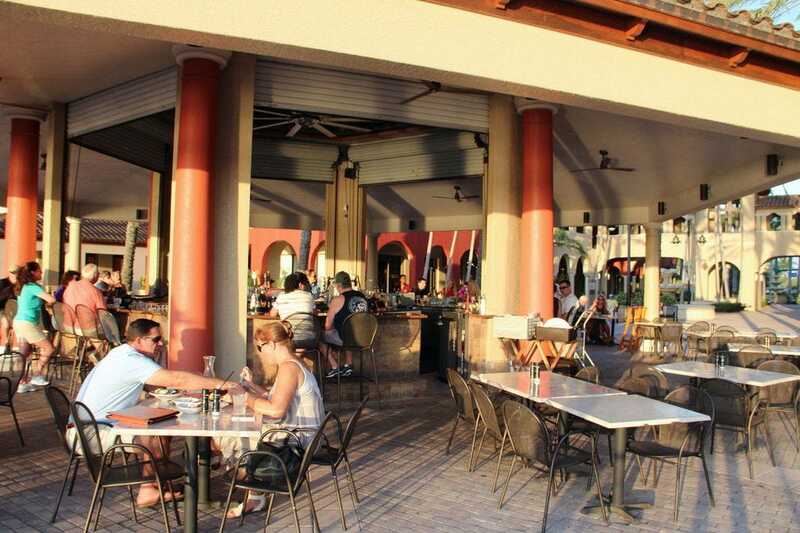 Overlooking the marina along the Esplanade shopping and entertainment center complex on Marco Island, Mango's provides a pleasant al fresco and indoor venue for breakfast, lunch, cocktails and dinner. Cheerful and oh so islandy, its menus give everyone something that pleases, from a nicely creative breakfast menu (try the king crab avocado) to fresh sushi, soups from scratch, burgers and fresh Florida catches of the day. It touts its "Marco's Best Salads" selections - a salad bar or selections such as king crab and avocado salad. Live musicians entertain throughout the week, and happy hour runs from 3 to 7 p.m. every day. Fin Bistro, recently relocated, lives up to its name by carrying and preparing fresh, fresh fin fish in a nice variety, along with local shellfish. 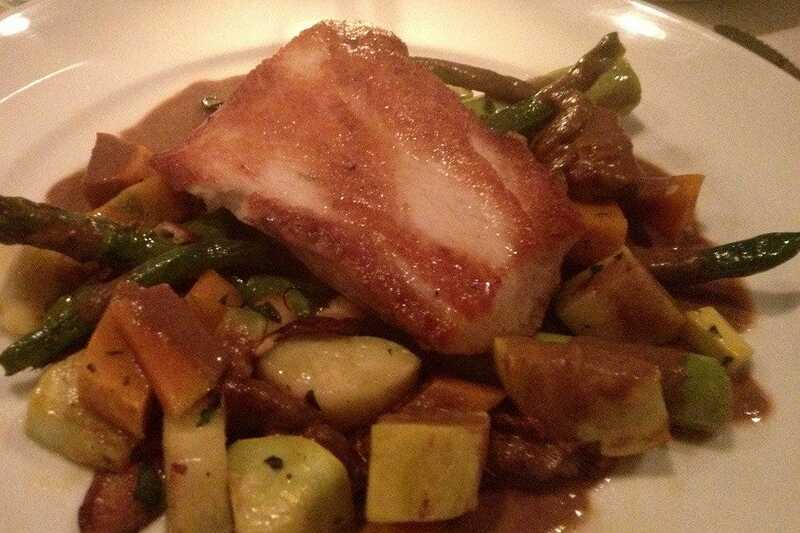 In most cases, the fish comes simply prepared but lovingly complemented with seasonal vegetables and original side dishes such as the bacon wrapped arugula potato cake with the Key West swordfish with Calvados stone ground mustard jus. Meat-lovers find a treat in the cider brined pork tenderloin, its sweet saltiness balanced with smoked tomato butter and accompanied with a chilled farm bean salad and roasted garlic and potato puree. The atmosphere, too, veers toward simplicity - tile floors, white linen tablecloths, dark wood chairs and minimal wall decoration. Through the decades, the historic Olde Marco Inn's dining room has evolved into a gracious Victorian setting with a cranberry glass chandelier and Audubon prints. 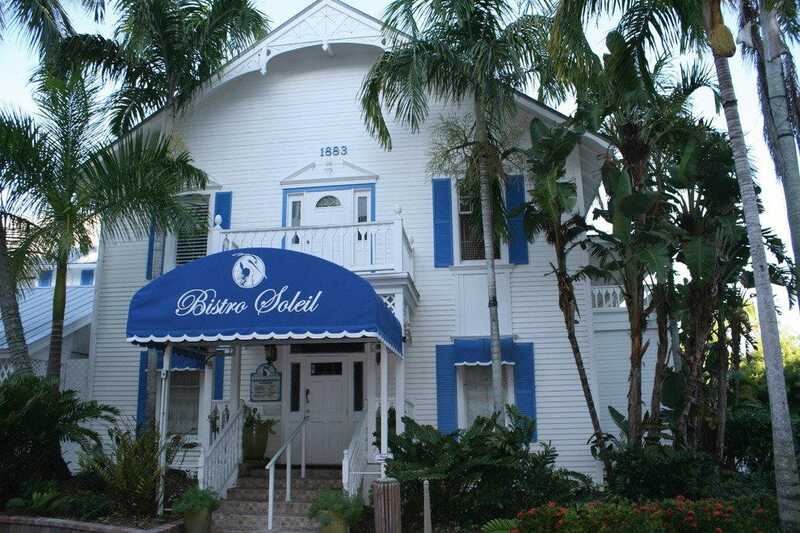 Bistro Soleil, with its delightful Continental interpretations, sheds new light on a longtime Marco Island culinary tradition. For starters, the sun-dried tomato and basil veloute gratinee with Swiss and blue cheese, or Prince Edward Island mussels steamed with herbs and white wine, immerse you in Chef Denis Meurgue's irresistible style. Reasonably priced follow-up courses continue to tantalize with offerings such as wild mushroom risotto; slow-roasted crispy Long Island duck a l'orange; cassolette of seafood, vegetables, and mushrooms in saffron cream sauce; tilapia topped with crab and capers in lemon butter sauce; fresh beignets with chantilly; and homemade warm apple tarte tatin with vanilla ice cream and balsamic vinegar reduction. A new addition to the Hilton, it opened in 2018 to replace the former beach bar with a spiffed-up version that has also improved upon its food and beverage offerings for breakfast, lunch and dinner. Start with something crafty and refreshing off the cocktail menu. Flatbreads, burgers, salads, sandwiches and creative apps and entrees make up the lunch and dinner menus with an Asian twist. Under "Sandwiches and Such," you'll find Cuban sandwich, burgers and Baja tacos - all with inspired touches of sauces and condiments. Dinner entrees range from lentil cake with roasted Brussel sprouts for the vegan to bone-in ribeye and short ribs for the serious carnivore. The divine Tesoro dining room, the newest addition to the JW Marriott upbranding of the past few years, is open to the adult public for dinner. 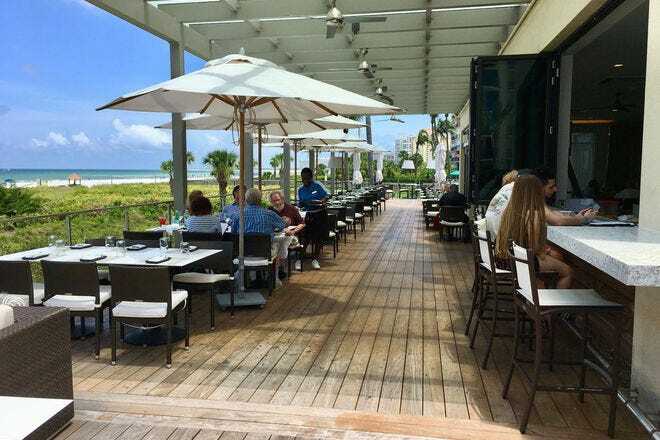 Its highly contemporary open-flow lounge, bar and Sunset Terrace spaces are also accessible for lunch with views of the resort's inimitable broad, sugar-sand beach and Gulf of Mexico. At dinner, the dining room, with its exhibition kitchen, windowed walls and abstract nuances of waves, serves Mediterranean-style tapas and seafood. Begin with house-made charcuterie or raw oysters dressed in burnt citrus mignonette, then sample small plates such as black baba ganoush and carbonara flat bread, or a full serving of grilled lobster with inked zuppa de peche. Finish with flourish: the chocolate terrine with mint tea and pistachios, perhaps. On its extensive wine list, you will not find one California vintage. Strictly Mediterranean wines, and that carries through to other bar offerings: Italian Malfy gin, for example, rather than the typical British varieties; sangria and Negroni. Whether it's your fantasy to dine under the Tuscan sun or the Florida moon, Sale e Pepe brings it to reality in a replicated, palace-proportioned, Italian villa setting with an outdoor terrace. Perched on the second floor, it affords a gulf view. Inside, choose a formal frescoed dining setting or a more casual lounge setting. Everything's made fresh, from the crusty breads to the pasta, soup, sausage and hibiscus panna cotta. The succinct dinner menu adapts to the seasons, paying tribute to antipasto, fish, meat and pasta. In the pasta department, there might be sweet corn and ricotta stuffed agnolotti. From the "terra", try the breaded veal chop with buffalo mozzarella salad; from the "mare," crispy skin Scottish salmon with orange beurre blanc. 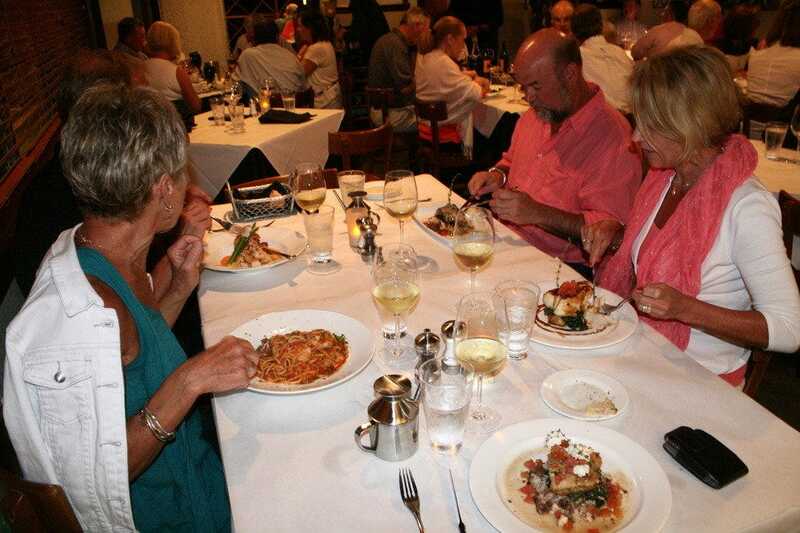 The formal dining room also offers a tasting menu and summer early dining specials. Stop in the huge gas lit bar, a shrine to artist Toulouse-Lautrec. 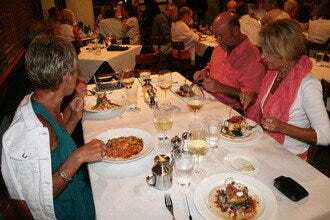 Subtitled "an American Bistro," Verdi's has been Marco Island's culinary boast for well over a decade. Don't be fooled by its simple strip mall setting. The kitchen offsets the simplicity with marvelously crafted seafood and meat dishes presented with style and multi-dimensional flavor. Here's a small sampling: pan seared Chilean sea bass with hoisin sauce glaze, sauteed spinach, fingerling potatoes and tomato concasse; triple tail fish Mediterranean style with sauteed spinach, tomatoes, green and black olives and jasmine rice with feta cheese; and its signature grilled New Zealand rack of lamb with garlic mashed potatoes, asparagus, port, and lamb and mint demi-glaze. Alcohol is beer and wine only, but the wine selection is robust and varied.